We are competent in providing our valued clients with the best Scaffolding System. These ladders are precisely manufactured using optimum-grade aluminum and steel and others; in complete adherence with defined safety parameters. Furthermore, in order to meet multifarious demands of the clients, we have made the offered ladders available in different sizes and specifications. 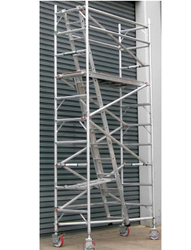 Looking for Scaffolding Systems ?